It can be quite useful to have a query that will list all of the tables in your database that currently hold full text indexes. Fortunately there is a function we can use, ObjectPropertyEx. We’ll combine it with a system view named sys.tables which gives us a list of all the tables in the current database. Note, for todays example I will continue to use the AdventureWorks database, AdvWorksCatalog, and index I created in yesterday’s post on the FullTextCatalogProperty function. This returns a list of the table name, and the value of 1 indicating the table does have a full text index on it. To get a list of all tables, simply omit the where clause. Tables without an full text index will have a 0 for the IsFullTextIndexed value. We can further extend this function by using a second property, TableFulltextItemCount. This will tell us how many rows exist in the full text index for this table. In this case the number of rows matches the number of rows in the table. This is because I have change tracking set to auto, and have a speedy system. Be aware there are times when this number won’t match the row count. This would primarily be when you have change tracking set to manual, have inserted new rows in to the source and have not issued the command to force the update of the full text index. By comparing the TableFulltextItemCount to the number of actual rows in the source table, you can monitor your system health and activity. If you see the numbers grow ouside the normal boundaries, it can be an indication something is wrong. You can also use it for adjusting the frequency of manual update commands. If the numbers grow apart too much for your comfort, you may wish to make the updates occur more frequently. Conversely, if most of the time the numbers match you may wish to reduce the frequency of manual updates. It’s not absolutely required to go to the sys.tables in order to get the count. If you already have the name of the table, you can use it in combination with the object_id function to get the count for that one table. Using the above logic you could easily create a function to pass in the name of a single table and get the number of rows in the full text index. As you can see, using ObjectPropertyEx with its two simple full text search related properties will give you some useful functionality for monitoring your system. I’m pleased to say that Ubuntu 8.04 is probably the easiest install I’ve had to do with VPC yet! One quick reminder before we begin, when working inside the VPC your mouse will get “trapped” or captured by the virtual computer. You won’t be able to move outside of it. To get it released, just press the RIGHT side ALT key. Left side won’t work, has to be the RIGHT side of your keyboard. To start with, create a new Virtual PC. For a tutorial, see either my step by step tutorial or the video tutorial if you need more instructions. Since I had the space, I was using 768 meg of ram, and left the disk space at the default of 16 gig. If you can, try and use at least 512 meg of ram for good performance. Use the CD menu option to capture the desktop ISO you downloaded from Ubuntu, or if you have a real CD put it in the drive and capture that. When it launches, you’ll see this screen. (By the way, you can click on any of the screens to see the full size graphic, these have been resized slightly to fit in with most common browser sizes). Pick your language, I just took the default of English. Now press F4 to select an alternate starting mode. When it pops up, change to Safe graphics mode, as you see above, and press Enter. 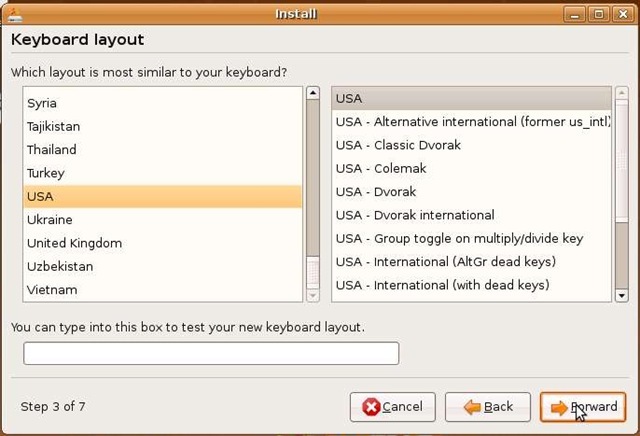 Now pick “Try Ubuntu…” (should already be selected) and press enter. 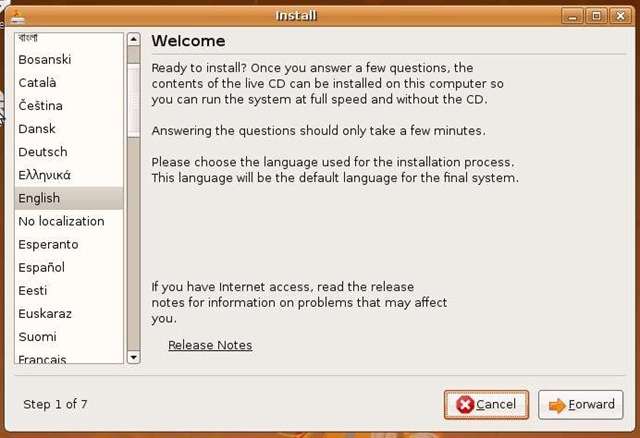 Do NOT pick the Install Ubuntu option, I kept getting VPC errors when trying to install directly. Additionally, don’t be alarmed if the screen goes black for a while, then you see some garbled graphics. This is perfectly normal, it is just passing through and will be OK when Ubuntu gets done doing it’s thing. It took me about 7 minutes to get from the previous screen to the next one. After it boots you should be in the live session trial environment. Double click the Install icon to begin the install process. Screen 1 is just a welcome screen, although you can change your language here if you need to. Press Forward to continue. 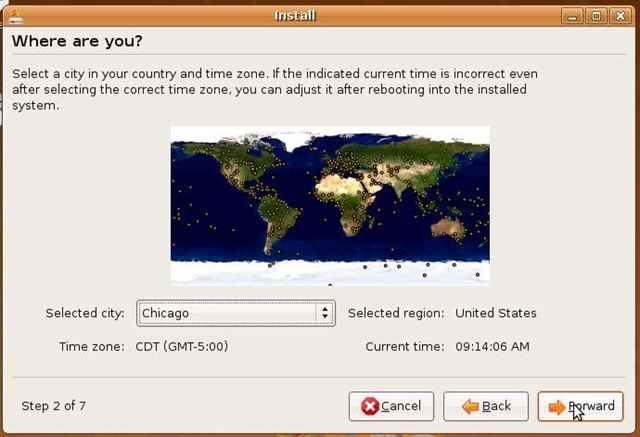 Next it wants to know where you are, at least time zone wise. I’m in the central time zone, but set yours appropriately and click Forward. Next you can specify your keyboard. Since I’m using a typical USA style keyboard, I just clicked Forward. Next it asks how you want your disk space partitioned. Since we’re in a virtual environment, it made the most sense to just take the defaults and click Forward. Be aware, after clicking forward my mouse went into the “I’m busy” mode, and there was a delay while the disks were prepared. Mine went about five minutes. Don’t be alarmed, just wait a few minutes and you’ll then proceed to the next screen. On this screen, first supply your name; this will be used in documents and the like. 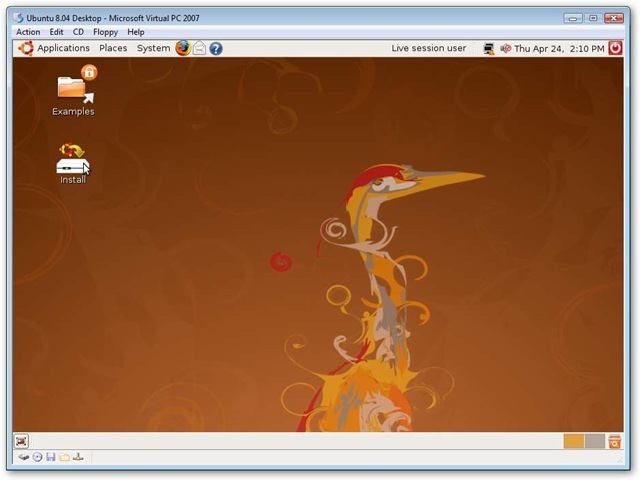 The next text box is the important one – it is for your Ubuntu user name. By default it uses your first name, now is your chance to change it. I rather like mine so will accept it. Next you’ll need to key in a good password and confirm, and finally name the computer. When you are happy, click Forward. Now is where you may get confused. In the screen above, you are on step 5 of 7. When you click forward, you are suddenly on step 7 of 7. I’m not sure what happened to step 6, I even ran the installer yet one more time just to make sure it was gone. Perhaps it was kidnapped by space aliens? Apparently even without the missing step 6, the installer has everything it needs. Just click Install to begin the install process. Kick back and wait. Don’t be alarmed if the screen goes black during the process, it’s just the screen saver kicking in. Just click in the VPC and wiggle your mouse and your display will return. I had it kick in several times during the 45 (or so) minutes it took to get everything installed. 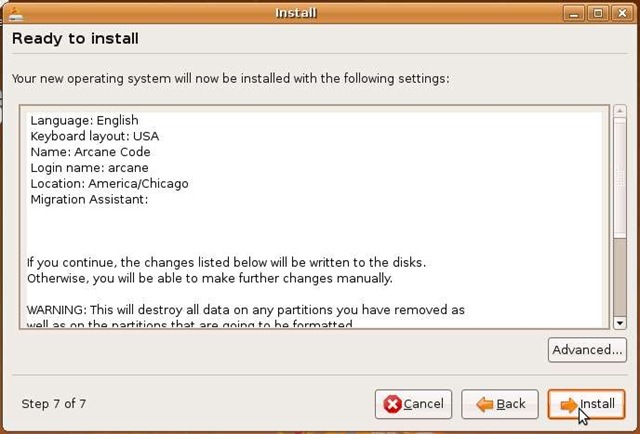 Eventually Ubuntu will complete it’s install, then give you the above message. 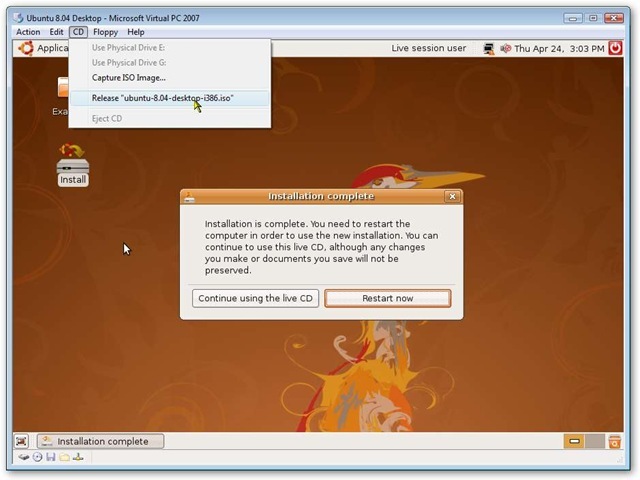 On the Virtual PC menu click CD, then release the cd. Then click on the big Restart now button inside VPC. This was the only real snag I hit in the whole install process, I waited a while and it never did restart on its own. I gave it about five minutes, then in the Virtual PC menu I clicked Action, Reset. I figured since it’s already installed, I wouldn’t lose anything, and I was right. The boot process does take a few minutes; you’ll see some text then a black screen for about 90 seconds. Then it comes up to the big Ubuntu logo and the orange bar as it loads. You’ll see some garbled graphics for a few seconds, then the login screen finally appeared. 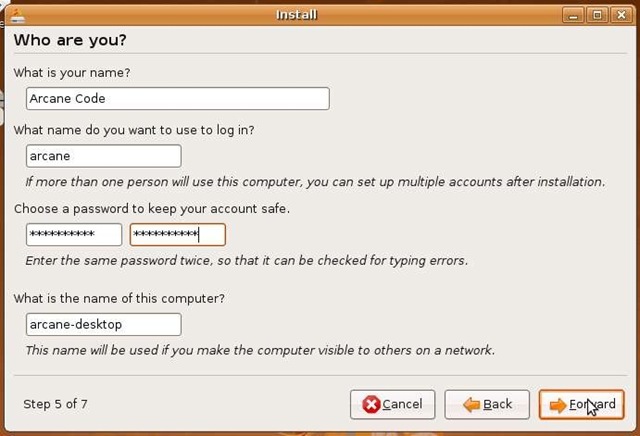 I gave it my user id and password, and minutes later I was in Ubuntu. One last piece of business, fixing the networking. First make sure the network card is mapped to a real network card in your computer. For more instructions on this, see my video, Virtual PC Advanced Settings. After that, click on the network icon in the upper right side of the toolbar, as you see below. Then just pick Wired Network. Once connected you’ll be free to visit your favorite websites! I haven’t had much time to check out other features, or get the sound working so if anyone has a quick fix for that by all means leave a comment below. As I promised last week, here is the second video in the Virtual PC Step by Step series. This video covers some of the advanced settings available in Virtual PC, and explains what the ramifications are for changing each setting. This video is the second in the VPC series, you can find the first one on this post from last week. I would appreciate some feedback, do you like the video format? Is it useful? I’m enjoying producing the videos, but I do find it takes considerably more time than a regular blog post. Let me know your thoughts in the comments area. At last Saturday’s BarCamp Birmingham, I gave three presentations. The first was on Virtual PC 2007. For more info on it just look to my previous post, which has the first video on VPC. I’m currently working on the other videos in the series and should have them up this week. My second presentation was “The Developer’s Experience”. As promised in the session, here’s the complete PDF of my slides: The Developer Experience. This has hyperlinks to all of the tools I presented. See you at the next BarCamp! 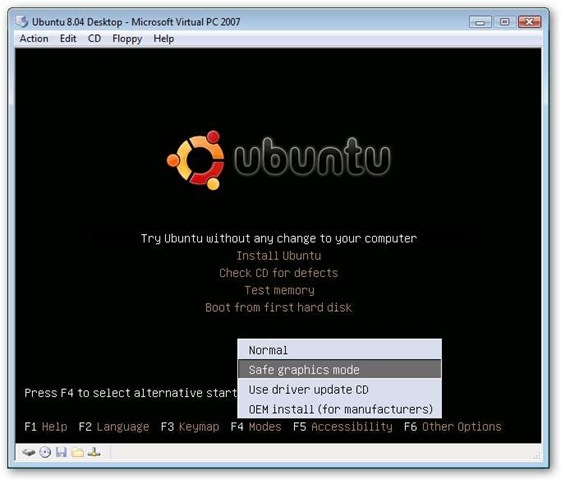 Some time back I wrote a post titled Virtual PC Step By Step, which detailed the steps to setup a new machine in Virtual PC. Since we now have a new version (VPC 2007) I decided it was time to update the post. Only now I’ve done it in video form! 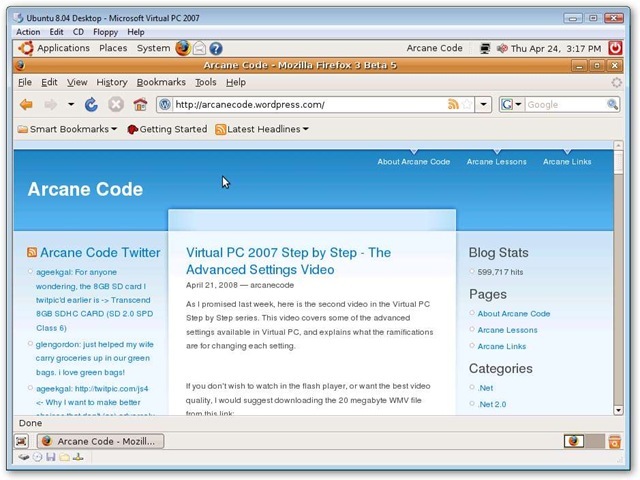 Yes, Arcane Code is now producing videocasts for the web. This is the first in what I plan to be a series of video content. This is my first, so let me know how this works for you. Still working out various video editing settings, as well as the many options for WordPress. Your feedback will help to improve future productions.